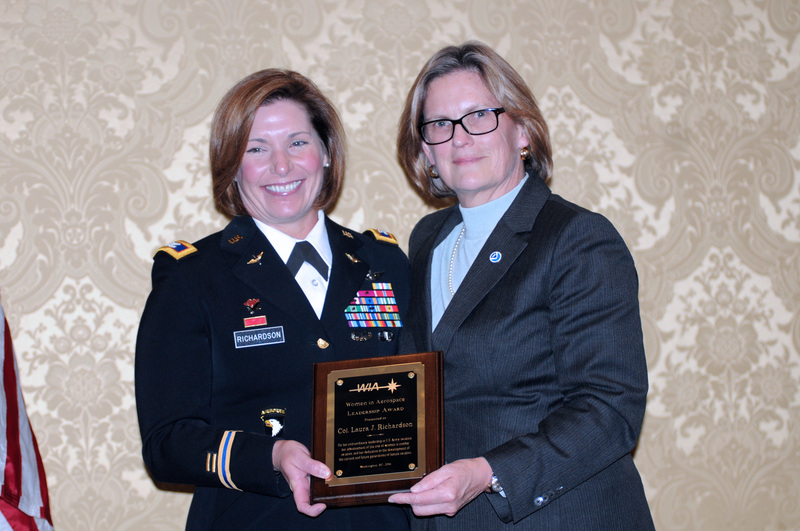 WASHINGTON (Nov. 02, 2011) -- Before taking home the 2011 leadership award from the non-profit Women in Aerospace organization, Col. Laura J. Richardson said she believes the challenges for both men and women in Army aviation are largely the same. "I think they are the same challenges [for] everybody -- if they are going to be a leader in Army aviation, they have got to compete for the assignments as commanders," Richardson said. "Work as hard as you can and be as competent as you can in your profession." Katherine Sullivan, the first American woman to have walked in space, presented Col. Laura J. Richardson, a Black Hawk pilot and commander of the Army's Operational Test Command at Fort Hood, Texas, with the 2011 Women in Aerospace leadership award during a ceremony, Nov. 1, 2011, in Washington, D.C.
Now commander of the Operational Test Command at Fort Hood, Texas; recipient of seven air medals, recently selected for promotion to brigadier general, and having some 1,400 hours in the cockpit -- with more than 400 of those combat hours during a tour in Iraq in 2003 -- Richardson is in a good position to comment on the state of affairs of women aviators in the Army. During a ceremony Nov. 1 in Washington, D.C., Richardson, a Black Hawk pilot, was given the leadership award from Women in Aerospace. The non-profit group aims to expand opportunities for leadership and visibility for women in the aerospace community. Her award citation reads "for her extraordinary leadership in U.S. Army aviation, her advancement of the role of women in combat aviation, and her dedication to the development of the current and future generations of female aviators." Richardson said she was honored for the award, and thanked those who had nominated her for it. She also cited her military career as a point of pride. "My 25-year career in the Army has just been super, and I am thankful I have been able to serve, and serve this long and I would not trade it for the world," she said after receiving the award. "To the other ladies who are receiving awards, I am just so honored to be standing among you tonight." Richardson was commissioned in 1986 and says since then "opportunities for women open wider and there are more opportunities for women in service." When she first entered service, she said, women aviators were not allowed to fly combat aircraft -- that restriction has now been almost completely removed. "When I came in, I couldn't go attack aircraft, I couldn't fly Apaches, I couldn't fly Kiowa Warriors," she said. "I had to either go Chinook or Black Hawk or stay Huey. Nowadays, women can fly Apache and Kiowa Warrior." Women aviators in the Army can still not serve as pilots in special operations aviation, however, a hurdle Richardson said she'd like to see overcome. Though she said she sees a broader push now for more opportunities for women Soldiers. "I don't know that there's a push per se for that particular skill set [SOF aviation], as much as there is overall with women serving in combat positions," she said. "There is, I think over the past year, more and more folks are thinking that the positions that are currently closed to women should open up and women should be able to serve in them." Richardson also said she'd like to see another first for women in the Army aviation community -- a woman at the helm of the Army's aviation branch. "There are a lot of things you can do, by the time you get to that rank, and where you have worked -- assignments in the Pentagon, assignments on the Hill, wherever -- you kind of have an idea how the Army works and you can shape your branch that you came up in," she said. Today, Richardson serves as commander of the Army's Operational Testing Command out of Fort Hood, Texas, a role she assumed in July. There, she focuses not on aviation, but on testing in a real-world environment the equipment the Army wants to field. The OTC she said has been testing equipment like the Stryker Double-V Hull Scout Kit, or the Rifleman Radio, and will soon test the Stryker Double-V Hull Mortar Carrier Kit. The OTC is also involved in the Army's Network Integration Exercise. While developmental testing happens in the lab -- with air conditioning, optimal testing environments and "men in lab coats," at the OTC, it's real Soldiers working with the equipment the way it's meant to be used. "You give it to a bunch of people like us -- we bang it around and get it out in the 100-degree heat and get it all dusty and dirty and throw it around and drop it," she said. "We do our mission. We go through bush, the weeds and the trees. We are the last stop, the truth. They call us the honest brokers with equipment. We are not going to lie about it, we are not going to say it is what it isn't -- it either works or it doesn't. Either the unit can do the mission, and they can do their mission better with this equipment -- or not." For young women in Army aviation -- perhaps even for men in Army aviation -- Richardson said getting ahead means having goals. "Set goals early. Have some goals. Don't just plod along and not have ideas about what you would want to do in the service," she said. "There are so many opportunities in the Army." She said some of the things she has done in the Army she had no idea early on those opportunities even existed -- the Army chose her to serve as the military aide for Vice President Al Gore, for instance. She also served as a military liaison officer in the U.S. Senate. "I didn't know I could do that," she said. "I didn't know that as a major, I could go and work for the vice president, or the president." Richardson says young officers should take advantage of those opportunities -- in between the times they get to do the things they "love to do" -- being in the field, and being in command, she said. "There are great positions that you can do and take advantage of -- internships, fellowship programs and all different kinds of things," she said, things that are career-building. She doesn't know exactly where she'll be in the future, but Richardson says she hopes to continue to live up to what WIA has honored her for -- being a leader of women. "I just hope to be a role model for women in the Army, and do the best that I can," she said. "People really don't care -- as long as you do your job -- what gender you are, what race you are, what ethnicity. It really doesn't matter if you are confident and competent in what you do." Richardson's awards and decorations include the Defense Superior Service Medal, Legion of Merit with two Oak Leaf Clusters, Bronze Star, Army Meritorious Service Medal with three Oak Leaf Clusters, Air Medal (seven), and Joint Service Commendation Medal.